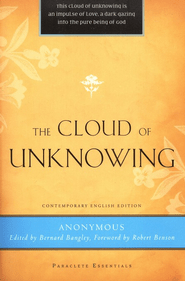 In this series of posts called “Love Alone Is Eternal” I earlier referred to what one writer calls “the art of unknowing.” This idea is taken from the title of a classic medieval book, The Cloud of Unknowing. This anonymous work comes from the fourteenth century but it expresses something about the Christian faith that was more widely known in the Christian East for centuries. In the East “dogma” is never understood as doctrine which explains or defines the truth. Dogma defines or explains what is not true. It was used, as we saw earlier, to explain heresy and error. Simply put, this means that in order to understand the mystery of the faith we must let go of errors and rest in the Truth, who is not a series of dogmas but a divine person. I cannot resolve the problems that you will have in coming to “see” that God is, in his essence and nature, love. I will offer some insights, stories, poems and ideas. But I cannot resolve all the problems. You will have doubts if you employ rational arguments and carry on internal debates. Such debates will only confirm our reason’s illusion that Truth is subject to judgment. It we refuse to accept our unknowing and search for some “high” or even esoteric knowledge that would explain it all, and forever do away with our doubts, our thinking may become more complicated and confused. We may get lost in a morass of speculation and mind-boggling interpretations, theories and fantasies. We may “solve” the Mystery but lose our rationality and our faith (Irma Zaleski, Who Is God?, 75-76). The greatest danger of all – to faith, hope and love – is to presume that we can understand God. Doubt acts as a governor on faith to help us face down our arrogant presumptions, to lead us to admit just how little we really know. The Zen masters are right when they say that doubt has a way of helping us to “begin again.” Our Christian ancestors understood this very well. We moderns have forgotten it. I hope you will recover it. Thank you John for your writing and thoughts. I very much appreciate this exploring of the unknown. How can an infinite God be anything but a sacred mystery to finite beings? The wonder and beauty is that God, who is beyond ever being fully known, has revealed much about himself to those with limited understanding of all things. I am now much more comfortable with mystery, after years of applying endless rational musings to “figure it all out”. I find Jesus to be a profoundly mysterious and unique individual. Yet I am drawn to him. I find the Father of the universe, and the Holy Spirit that covers over all, just as profoundly mysterious. But I am often drawn by the grace and love I know all three share toward me, a pilgrim believer, as well as the rest of an uncaring mass of humanity. What little I know and believe about God, from the revelations he has given, is enough to keep me following his way. Even that is a mystery to me. I am studying Matthew 20:1-16 this week. The generosity of God’s love shines through the way the landowner pays the “wages.” Those who have known the burden and the heat of persecution for Christ, for most of their lives, receive no more than those who come into the fullness of God’s love late in life (all receive all); my takeaway. I miss the point of the kingdom when I think otherwise. I really appreciate your work and the writings you share on this blog. Here the reference to truth as a person reminded me of something I had jotted down earlier this year. Hope it may be useful sometime. For a Christian, truth should be a person not a proposition. When we underestimate the Incarnation, turn Christ into a proposition and downplay the Holy Spirit, we tend to overemphasize and overestimate propositions, look for proofs, depend too much on confessional statements, use Scripture as a mine for proof texts and generally act religiously. Christianity is more of a journey than a religion. It acknowledges way, truth and life as a person, the Son of God – God himself. It also acknowledges a human lostness that can only be overcome by life in the Spirit. It’s not a matter of finding the truth and hanging on against all opposition. Rather its a matter of releasing ourselves to be in truth, in Christ, through the work of the Holy Spirit. The propositions we often hold so dear are only as good as our minds, only as permanent as the relentless march of knowledge. Scripture is not a written in stone collection of words but a story of people who were being taught by God to be in him not about him. We are to enter into Scripture with the Holy Spirit, the same Spirit who instructed all those who had something to do with its development in the first place. Spirit was before the written word; the living word is eternal. It’s the Spirit of the Word that is our goal not the letter. And the Word, like truth and life and way is a person. This is also the way to freedom. Alma Ruth liked this on Facebook.